At GoogleIO today, Google announced the limited launch of its Infrastructure as a Service product, Google Compute Engine. This comes as no surprise, the move has been rumored for months and Google does undeniably have some of the largest scale infrastructure on earth alongside the smarts to run it amazingly effectively – a potent combination that shoud result in them having the ability to deliver IaaS as well as anyone else. Delivering IaaS however is not just about the technology, it’s also about convincing customers as to the credibility of the service and building an ecosystem of providers around the core. Here’s an analysis of where GCE is at day one (with the caveat of course that these things change very rapidly and I’d expect Google to innovate quickly on the offering). Ten second summary – if Google wants to really broaden where Google Compute Engine goes, and its broader success, they need to build out the product, clarify the way it’s built, increase the ecosystem and most importantly prove to the marketplace that they’re serious about this project. From a VM image, mount persistent block storage (persistent disk) that maintains state beyond the life cycle of the VM instance. Data on persistent disks are retained even if your virtual machine instance suffers a failure or is taken offline. Persistent disk data is also replicated for additional redundancy. Connect your machines to the Internet with a flexible networking solution that offers static and ephemeral IPv4 addresses for your instances. Use an easily configurable firewall to set up network access to your instances. Create an internal network of virtual machines or set up access to external traffic by setting up customizable firewall rules. Connect your VM instances to each other and to the Internet with our fully encapsulated layer 3 network. Our network offers strong isolation to help protect your instances from undesired access. Locate other instances in your project using DNS lookup of VM names. Access your virtual machine instances through the Compute Engine console, RESTful API, or through a simple command line tool. Take advantage of OAuth 2.0 to authenticate to the RESTful API to create and delete virtual machine instances, disks, and other resources. Also, leverage OAuth 2.0 to seamlessly integrate with other Google Cloud services such as Google Cloud Storage. Use service account identities to authenticate your instances to other services, and remove the need to push keys into VM instances. Interestingly, according to RightScale, with GCE customers can encrypt data at rest both for local ephemeral drives as well as for network attached drives. In the case of the network attached disks the encryption happens on the host before it is put on the network, so it’s also encrypted in transit. This will be a boon for security conscious organization who need encryption both at rest and transfer. According to the RightScale post about the launch (RightScale are a launch integration partner) the offering is not API compatible with any other cloud. While many in the community are talking about the war between the API standards (with the AWS defacto standard on one side and OpenStack on the other) the existence of management providers such as RightScale sitting over infrastructure makes this something of a non-issue. Interestingly enough another management vendor, enSTratus, was not involved in this launch at all – that’s certainly interesting for those of us who hold enStratus up as an indicator. MapR is partnered with GCE to offer its Hadoop distribution for GCE users, which in itself is kind of poetic since Google themselves pioneered MapReduce for their own internal search. WIth GCE, Hadoop is coming back to Google infrastructure. In the big picture, the most significant and perhaps most profound reason for Google Compute Engine’s existence is the synergy with other Google cloud services. Currently Google offers Cloud Storage, Big Query, App Engine, and Cloud SQL as independent services. But if you look under the covers of App Engine there are services for message queues, push channels to browsers and mobile devices, NoSQL data stores, email, and more. All this starts to add up to as impressive a portfolio of cloud services as anyone can offer and up until today it was missing just one thing: a compute engine to tie it all together. 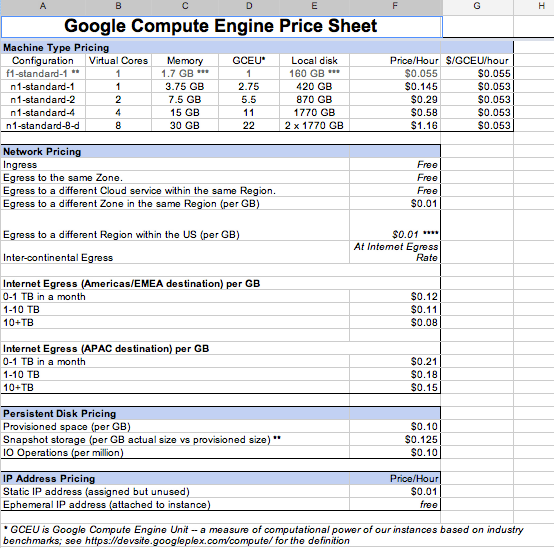 Google is promising pricing around 50% of other IaaS vendors – that’s eminently compelling, assuming the service is robust and fully featured (early days yet). However cost isn’t everything – the key thing for enterprise customers is whether or not a service has support attached and is backed by an SLA. In the case of GCE, Google asserts that GCE has an SLA behind it but in an ironic twist, the link to the SLA detail page is dead. As for support – Google is going to offer paid support for GCE customers but only via a discussion with the Google sales team – that will gives prospective customer cause for concern – Google needs to be very clear about the cost, availability and the breadth of the support offering. First a caveat – this is day one and no cloud product can be expected to be 100% sorted from day one. Google has an amazing economy of scale when it comes to infrastructure and those economies should be able to deliver IaaS on a very price competitive basis. That said, delivering enterprise grade solutions backed by clear SLAs and excellent service is probably something that Google struggles with – hence their focus on project based workloads that are all about bashing massive amounts of compute at a problem. In fact at their launch Google told of the Institute for Systems Biology who went from a 1,000-node internal cluster to a 10,000-node Compute Engine deployment, reducing the time to find associations within a genome from 10 minutes to “a few seconds.” That’s compelling for that particular use case, but if Google wants to really broaden where GCE goes, and its broader success, they need to build out the product, clarify the way it’s built, increase the ecosystem and most importantly prove to the marketplace that they’re serious about this project. So far I’ve come to a lot of the same conclusions you and others have. Their real play isn’t going to be determined until they start delivering services around the IaaS options.